Regional Council Alona (Haifa District, Hadera subdistrict) is situated in SE Mount Carmel region, east to Benyamina. Named after the oak woods in the area and established in 1953. Pop. 11,000. City hall in Moshav Amiqam. I spotted a yellow flag with emblem at the city hall. The municipal emblem was published in the official gazette (Rashumot, Yalkut ha-Pirsumim), YP 989, 10 January 1963. Regional Council Alona was established in 1953 in order to give municipal services to three settlements which were founded by BETAR and ETZEL members: Amiqam, Avi'el and Giv'at Nili. 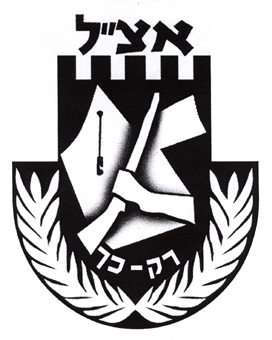 The emblem include an oak tree and a map of Israel-Land as appeared on National Military Organization (ETZEL, a.k.a Irgun) emblem in the mandate era (see: <www.etzel.org.il>). Above them there is a vine (the area is known for many vineyards) and around it the biblical slogan "Those who sow with tears will harvest in joy" (Psalms 126:5).